It's coming. I can count the number of days before I leave on one hand. The approaching Camino is stirring up many feelings - anticipation, dread, hope, concern - all a boiling cauldron of mixed emotions. The questions that haunts me: Will this Camino be as enjoyable as the last or will it be a disappointment? Will the new Camino enhance the experience I had last time or diminish it? Worry, Worry, Worry. Last Camino I went with a blank slate and just absorbed everything with wonder and excitement. This time I will know what I'm getting myself into. Will the wonder still be there? I am consoled by the fact that I met so many people who were on their second, third, or fourth Camino - None of them seemed disappointed. So to counter these negative feelings I started to make a list of all the things I want to do that I didn't do last time and will now have the chance to accomplish. As I put the list together I realized that there are many things I am looking forward to. Visiting the Monastery of San Juan de la Peña. The monastery is located under a cliff and people say it is incredible. We will be taking a bus to the monastery on the fifth day and walking from the monastery back to the Camino Aragones. Walking part of the Arles and the whole of the Camino Aragones, all nine days worth, will be new and is described by some as beautiful. Taking a tour of the chocolate factory in Astorga. I missed it last time but this time ... this time there are free samples with my name on them. Visiting the Monastery of San Julián de Samos and the nearby abbey the Real Abadía de Samos. Last Camino I bypassed Samos. Looking at pictures and stories about these places, I will not miss it this time. As a matter of fact this will be our longest walking day because we really want to visit Samos. Taking the roof tour of the Cathedral in Santiago de Compostela. I know people who have done it and it sounds interesting. Doing a walking tour of Santiago de Compostela. I found one that takes you up to a nearby hilltop with panoramic views of the city. And then there are the immaterial things. Seeing the fall colors across northern Spain. Though I will miss the Spring flowers I experienced last time, autumn had it's own color palette. Topping the crest of the hill on the way to Cee and seeing the Atlantic Ocean for the first time. It was special on my first Camino and I know it will be just as special this time. Seeing the sunrise over the plains of the meseta and the mountains of Galicia. Heck, I just want to see the sunrise everyday. I like the quiet of the morning and the feeling of a fresh start. I like to watch the world wake up around me. Seeing the sunset, something I never did during my first Camino. When I walked last time the sun set after I was in my bunk. This time the sun will be setting at a more reasonable time. I'm especially looking forward to seeing the sun set over the Atlantic Ocean at Faro Fisterra. When we get there the sun will be setting before 8:00PM. Seeing the stars on a clear night. The word Compostella is derived from the Spanish phrase meaning Field of Stars. The remoteness of many places along the Camino should give a spectacular star show. I'm especially looking forward to Albergue San Bol located by itself on the Meseta far from any town, and La Faba on a mountain trail in Galicia. Hoping for clear skies at night. What would the new be without the old? I anticipate a flood of memories of the first time I walked the Camino Frances. I look forward to overlaying new memories on the old. Every journey is different, even if you follow the same path. I will be following new trails, staying in new places, and meeting new people and that is enough for me. The week is half over and I can feel things not going anywhere. This week was going to be a rather busy one but it's turning into anything but. The first thing that was going to happen was the ripping up of the crappy linoleum and the installation of tile in our hall bathroom and kitchen. Due to scheduling conflicts the installation won't be done until after I return from the Camino at the end of October. There were a few things I was going to do in the backyard - gardening stuff and mowing - but the temperatures have been close to 100°F (37.8°C) most of the week (and will last the rest of this week). Add in the humidity creating horrendous heat indexes and working outside has been scratched of the list. The high temps have also reduced Iago's exercise from daily walks to chasing the ball up and down the basement stairs. Black dogs don't do well in this heat and humidity. Neither does it do any good for fair skinned fifty year old dog walkers. Now, you would think with the cancellation of the installers, the reduction of working and walking due to heat, and the halt to my training hikes, I could fill the whole week with total Camino preparation immersion. You would be partially right except for one thing. My chigger bites have been really itchy so I've been taking Benadryl which means it's lights out for me. I've spent a lot of today and all day yesterday virtually in a coma on the couch without an ounce of get-up-and-go. 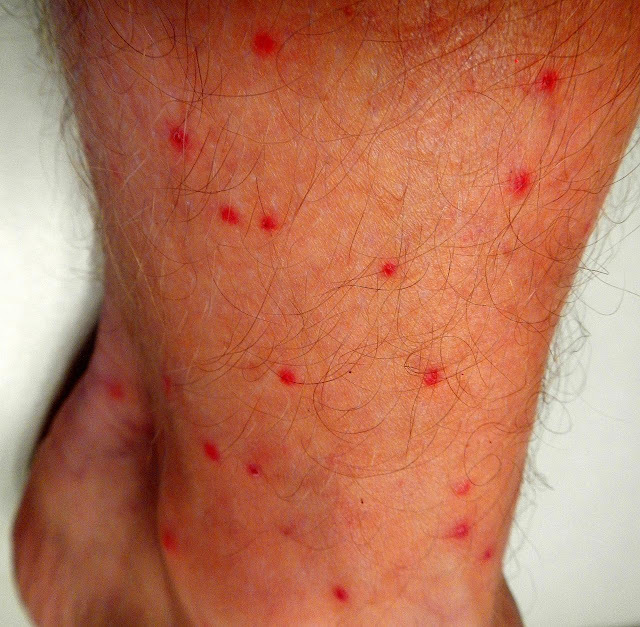 Chigger Bites on my lower calf and ankle. Makes you want to itch, doesn't it? I have no idea how long the itching will last or how long I will be on Benadryl but I hope it ends soon. I have no idea when the heat wave will give way to more fall like weather. I hope it's soon. There are things for me to do and preparations to be prepared. I'm tired of playing connect the dots on my legs. Oh, and the idea of sitting on a transatlantic flight with a major case of the itchies is not very appealing right now. Those bugs I mentioned in my last post - the ones I guessed were probably harmless - yeah. For every one I saw, and I saw dozens, maybe hundreds, there were two I didn't see. And they all bit me. All up and down my legs I've got little red bumps that itch ... no, I mean they ITCH!. I'm guessing they were chiggers. I haven't had chigger bites since I was a little kid living on the shores of the Lake of the Ozarks. I haven't missed them. And now, I'm making up for lost time apparently. I hope they go away by the time I start walking the Camino. Tomorrow I'm going to treat my bag liner, pack, and pack liner with permethrin. The last thing I need following all these chigger bites are bedbug bites. Today I decided that I've trained enough for my upcoming Camino. This past week I did three hikes. The first two were urban hikes. The first was 8.58 miles (13.81 km) and the second was a slightly shorter 8.52 miles (13.71 km). My new shoes feel like they are broken in though they will stretch a little more during the first week or so on the Camino I'm sure. The third hike of the week, today actually, was a Backwoods' Outsider Hike. 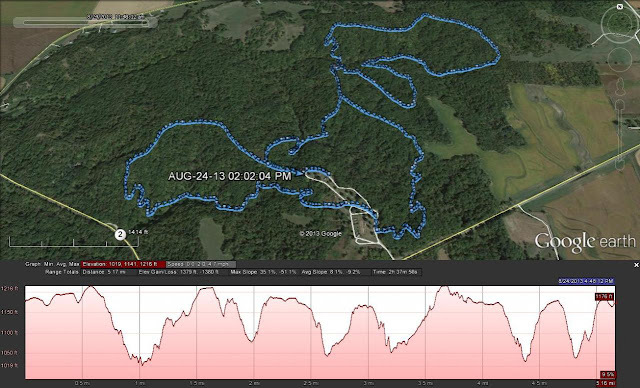 This month the Outsiders Hike was at Waubonsie State Park. I'd been there before (My post about the hike is here) but there are two parts to the park and I'd never done the equestrian/multi-use portion of the Waubonsie trails. We did the trails in two halves. The first was a mile and a half loop through forests and up and down hills. It was very beautiful actually. The loop returns you back to the parking/camping/equestrian area. We rested a bit here before crossing the camping area to the trailhead of a second loop. Across the trail was a rope with a "Trail Closed" sign hanging from it. We all looked at each other (there were about fifteen or so of us) and we decided to ignore the sign and head in anyway (we later got our picture taken posing in front of a trail closed sign - we are such rebels). The trail was being repaired. You could see signs of a tracked vehicle and a lot of soft dirt on portions of the trail. This loop turned out to be a bit over three and a half miles. There were some major inclines along the way - first down, then up, then down again, before finally going up a very steep slope. At the top of the slope the trail connected to the first loop we'd hiked and we followed it a short distance back to the cars. I have to admit that this second loop pooped me out. The steep hills really sucked it out of me. Plus there was the minor feeling of panic. What's that you say? What caused the minor panic? Along the second loop, one of our Backwoods hosts found a tick on her leg. Farther on she found another. Then we all started inspecting our legs very closely. I looked at my pants and saw dozens of little speckles which looked like I'd been sprayed with a fine mist of mud. Then, as I watched, the specks of dirt started to move around. At first we were all convinced that the specks were baby ticks. That is what caused the minor panic as we started to hike faster - If I walk fast the ticks won't get me right? Things calmed down later on the hike as the Sierra Club naturalist who was with us suggested that this was not the right time of year for baby ticks. We all concluded ... or maybe the right word is deluded ourselves ... that the specks were probably some form of mite that was surely harmless and non-blood sucking. (I've mentioned mites before.) When I got home all my clothes went straight into the washer and me, I went straight into a hot, soapy shower. I still feel itchy all over. So My training is over for now. Not because of the bugs but because I think I've prepare enough (there is also the fact that next week the temps will be approaching the 100°F mark). In the nine months leading up to my first Camino I walked 217 miles (349 km). In the last nine months before this camino I've hiked 641 miles (1,031 km) - 603 of those miles this year alone. To take these numbers even farther, I've walked 1,312.75 miles (2112.7 km) since my last Camino. This is more than all the walking I did before my first Camino. Last weekend we went to our last concert for the summer: Peter Frampton's Guitar Circus featuring Sonny Landreth, B.B. King, Larry Carlton, and Rick Nielsen. The tickets (as you can plainly see above) said that the show started at 8:00PM. That ticket was soooo wrong. We left early thinking it might be a bit crowded and when we got there at around 6:50PM there was live music playing. We entered the open-air venue and found the Stir Cove to be completely packed solid. I have been to a few concerts here before but I've never see it so full. We walked around a bit and shoehorned our folding chairs into a tiny space near the side of the crowd. The live music was from Sonny Landreth and his band. They started around 6:30PM so we only missed some twenty minutes. What I did hear was really awesome. Unfortunately he has a rather short set. After Sonny left the stage B.B. King's band came on and played a song before B.B. King took the stage. During his set I would say he started maybe four songs and never really finished any of them. He just seemed to meander around the music, asking the crowd to sing along, and playing some pretty awesome, but short, guitar riffs. He was even joined on stage by Peter Frampton for a song. I have to say that I was slightly disappointed. A complete song would have been nice. But, being a month shy of his 88th birthday, B.B. King can pretty much do as he pleases. What he did sing and play was awesome ... he just left me wanting more ... much more. The third act was Peter Frampton. He was incredible. He played all of his old stuff along with stuff I'd never heard before. He played a cover or two including a smoking version of Soundgarden's "Black Hole Sun". He was joined onstage by two guest performers. The first was Larry Carlton. They played a couple of rocking songs together - both were incredible. The second guest was Rick Nielsen (Cheap Trick). I've had a couple opportunities to see Cheap Trick in concert (one of those free) and I failed to do it both time - I will not let a third opportunity pass me by. Rick and Peter played two of Cheap Trick's best songs: "I Want You To Want Me" and "Surrender". The vocals for these two songs were done my Peter Frampton's son, Julian Frampton. Frampton ended his set with a rocking "Do You Fell Like I Do". The place went crazy ... including the drunk dude behind us yelling "Peter Frampton Comes Alive" at the top of his voice. We got up and left soon after, before the encore which turned out to be a cover of George Harrison's "While My Guitar Gently Weeps" played by Frampton, Carlton, and Nielsen. We heard most of it as the traffic getting out of the parking lot was slow and we could hear the music clearly. We probably should have stayed though since it sounded awesome. All it all the concert was pretty incredible especially if you are a guitar fan like I am. A great finisher for the 2013 summer concert season. P.S. Sadly I forgot my camera. Would have loved to get a picture of B.B. King and Peter Frampton together. Camino Dreams Or "Where Are My Pants?" Okay, for the past couple weeks I've been having weird dreams. They all are different but they have some common themes. I've gone on business travel, have been separated from my colleagues, and I can't find the hotel. I have been told I need to complete a job task but I realize I have no idea how to complete the task. I am late in delivering my homework because I can't find my homework ... or my dorm room ... or my locker ... or my entire school. And then there's one I haven't had for many years. Maybe decades even. It's one of the most common dreams really. You know the one. You're getting ready to give the big presentation ... or book report ... or sales pitch ... or any life changing public activity when you realize you aren't wearing any pants. Yes, I had the "Where are my pants?" dream last week. The dream has grown up a bit -the type of underwear has changed to a more adult choice - but the fear and panic are still there. It seems my subconscious thinks I am not ready for something. Gee, I wonder what it could be. The Camino perhaps? Book: Mike Rogers' "Riding Around America: A Photo Collection & Travelogue"
I have never read a book written by someone in my family before. 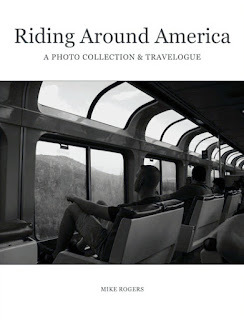 This ebook, "Riding Around America: A Photo Collection & Travelogue", was written by the Wife's GodSon. Not only was it the first book written by a family member but it is the first book I've actually made an appearance in. Hence, expect this review to be a tad bit biased. The publishing of this book was funded using kickstarter and was the first kickstarter project the Wife and I invested in. The book is a collection of blog posts and photographs documenting the GodSon's travel around the United States by train during the summer of 2004. During his 8,000 mile train trip he visits friends, family, and interesting cities along the way. The text is full of personal observations written in a colloquial manner that is easy to read. You can hear the wonder in his writing as he experiences new things and visits new places. The text is illustrated with seventy-five black and white photographs taken by the GodSon during the trip. The GodSon is an excellent photographer and has a great eye. These photographs do not disappoint. My only criticism is personal really. I agree that some images look better in black and white but I am also a fan of color. I would have prefered a mix but I'm sure there may be a taboo against mixing the two - like crossing the streams if you know what I mean. The book covers many subjects: travel, trains, baseball, just to name a few. The best part of the book, naturally, is between pages 41 and 49 where the Wife and I make an appearance. I have to admit that the GodSon is special to me. His blog, no longer available online, was one of the first blogs I'd ever read and it was an inspiration for Homer's Travels. The GodSon's photography pushed me toward taking my own pictures. Because of this I don't think I could really give a totally unbiased review of this book. I liked "Riding Around America" because it was personal for me. I also liked it for what it was, a good collection of photography and a good personal travelogue. Recommended. I want to know why short training hikes seem so much harder than doing a long training hike or even multiple stages along the Camino? It's one of my life's little mysteries. I really noticed it this month (though it's not a new phenomenon). In July I hiked seven training hikes - all but one were greater than ten miles and over half were greater than fifteen miles. In August I switched to the new shoes I'll be wearing on the Camino next month and, knowing you should always break in new shoes before going on long hikes, I cut the length of my training hikes, reducing them to the six to eight mile range. Now, I want someone to explain to me why those six to eight mile hikes are more difficult to do than the fifteen to sixteen miles hikes. I feel just as tired after these short hikes as I do after the long. I do recover faster but during the hikes I feel like I'm struggling. I said this wasn't a new phenomenon. It was one of the reasons I was nervous before my first Camino. After doing a training hike I didn't feel like I could wake up the next day and hike again. The nerves turned out to be unfounded. The Camino proved, if you fool yourself into thinking that the only way home was to get to your destination (even when this really wasn't true), you could get up every morning for almost 36 days straight and walk fourteen miles plus, with a backpack, and end most days with a smile on your face. So what is it? Is it physical? Is it psychological? I always hoped, as I continued to train, that walking would become easier. It's isn't happening. Each hike is tough. Each hike is mentally draining. Why was the Camino so much "easier" - I use this term is the loosest possible way - than these once or twice a week training hikes? The only theory I can think of is the novelty of the Camino. The new sights, sounds, smells, and tastes, the new people I met, they all distracted me from the strain of the hiking. If this theory is correct will my second Camino be harder? Only ten of the forty-one stages will be new. The others will be the same as my first Camino (though I will be stopping in new places along the Camino). Another thing to worry about ... Boo Hoo. When you see yourself in your mind's eye, what age do you see yourself? I've actually wondered about this myself. When I think of myself I feel like a teenager. I look at everyone around me as adults with more experience and maturity. So my self-image is a teenager, people have told me I don't look 50, and at times my body feels much older. I suppose this is normal. So, all you throngs of people who read Homer's Travels religiously, what age do you see yourselves? Do you agree with the calendar? Leave a comment with your Mind's eye view. After a concert-less 2012, I have made it a point not to do that again so, while the Wife was off learning about the Prairie School of Design, I went to my third concert of the summer: a Steely Dan concert at the Omaha Orpheum. The warm up act was a jazz trio, the Deep Blue Organ Trio consisting of drums, a guitar, and, obviously, an organ. They played a great set of jazz and blues to an audience who appreciated good music. The main attraction was Steely Dan. They were awesome. So many songs brought back so many memories. Their music spans my time in Guatemala when I spent hours listening to the radio and recording songs off of American Top 40 broadcasts on a crappy cassette tape recorder. It was good music and I had a good time. One thing about going to concerts performed by stars of your youth. Looking at the people around you and thinking how old they all seemed ... well, it's a reminder of where I am in my life. I'll have to think more on this next weekend when we go see Peter Frampton and BB King. Camino 2013: It's Starting To Get Real ... And A Little Reminder To Calm Down Already! Until recently, my second Camino was just a hazy event in my future. It always felt so far away. Being my second Camino I was not as uptight, nervous, and over-planning as I was last time. Not that I haven't planned. Heck, I acknowledge the fact that I've been planning it since I got back from my first Camino back in March in this post but I'm not sure I have been as emotionally invested as I was planning my first Camino. Not until this week, that is. Last weekend I started to feel a little nervous twinge. I began to feel a bit unprepared. Uncertainty creeped in. Am I really ready? I'll be in France for three days this time and ... I don't speak French! I think I've subconsciously become overdependent on GV who speaks French and who is doing a lot more planning for the first part of our Camino than I am. Shame on me for not being more prepared. I am trying. I am doing more research. I rewrote my stages ... again ... resulting in version 9.3 (version 9.3 sounds so much better that version 12 which it actually, kind of, is). I dropped a few places I'd visited before. Added a few places I'd never been before. Swapped a few things around. Overall I ended up evening out the stages a little better I think ... though that could just be an illusion. Not a Saint James Shell but close enough for South Omaha. I don't remember ever seeing a shell just laying around in Omaha. Who knows where it came from. 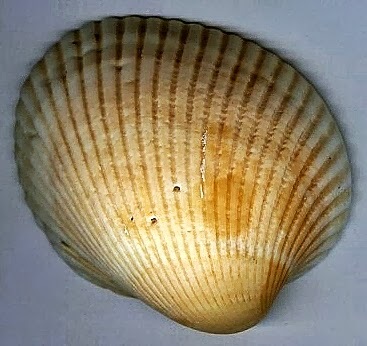 It's not a Saint James shell but, to me, a shell is a shell. A Blog Friend asked recently on Facebook if his friends believed in fate. I don't. I don't believe in fate, divine intervention, or an all powerful sentient universe. I do believe in coincidences though. I've met my share. This one came at an opportune moment. It calmed some of the butterflies I was feeling. It reminded me that I was actually less prepared last time and I made it through to the end just fine. You provide the will, and the Camino provides the way.